Wood, metal, and fabric apparatus for the professional magician. How the heck did I get here?! In my search for a better magic wand than what was available in most magic shops (black plastic with white plastic tips), I was having no luck. So I decided to make my own. I found a wood lathe on craigslist, brought it home and let the wood chips fly. 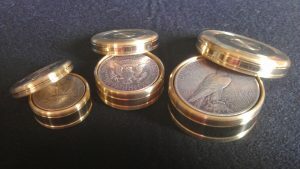 After some experience making wands and egg boxes from various exotic woods a friend of mine called me and said he had a metal lathe that he bought specifically for making coin boxes. He and a friend went through some frustration trying to get it to work. 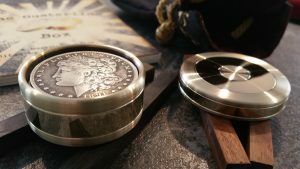 I took it off of his hands and collaborated with him on my first metal coin box. The box design has gone through many iterations and, as I tend to get bored, have changed quite a bit since the beginning. On this site you can see the stages they went through, and what’s available today. All of my gimcrack are made with the professional magician in mind. If I myself wouldn’t use it then I wouldn’t make or sell it. Check back regularly. New picture articles will be added as they are completed. Or join my mailing list and be notified of new posts on this site. pri·mal /ˈprīməl/ adjective -essential; fundamental. gim·crack /ˈjimˌkrak/ noun -a cheap and showy ornament; a knickknack. IF you really want on the email list *PLEASE READ* This distribution list is DOUBLE OPT-In, private, and vetted by me. Please use your real name, if you use a name that looks like an alias or is obviously a fake it will be removed from the list. If you don't want me to know your name trust me you don't want to be on this list. I'm NOT a company with employees. It is only me, one person, Craig Ousterling. The information you provide here is not sold or shared with *ANYONE*. It will be used by the one person (Craig Ousterling) who runs 'this site' and makes 'this stuff' to let you know about Primalgimcrack.com happy funtime stuffs such as convention showings, new or restocked gimcrack, trick ideas unlisted on youtube, etc, etc. Once you're on my emailing list you can unsubscribe anytime by clicking unsubscribe in any of the emails sent to this list. I do not send spam. The only spam I like is in Hawaiian grocery stores. Check your email to continue the sign up process!